Susan has written another poem even though she just wants to disappear. My pack is packed and I’m off tomorrow morning. I picked my friend Be Hope up under the I-10 freeway at 4 pm today. 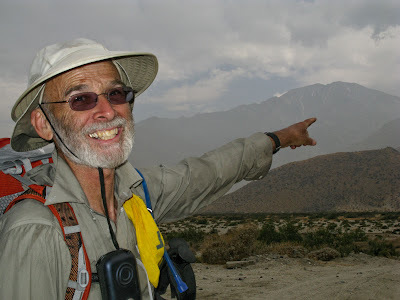 He hiked from Anza over the San Jacinto Mountains and on down to the pass at the I-10. Yesterday I bought a new Osprey EOS backpack. Today it is packed with 3 days’ of food. Tomorrow, I’m joining Be Hope as he hikes the 54 miles to Big Bear. Be Hope, having just crossed the 3 miles of desert from Snow Creek, arriving at the I-10 underpass today. Me trying to get a photo of my new pack without using a flash. Impossible. 11:50pm and home from another Thursday in Sherman Oaks. 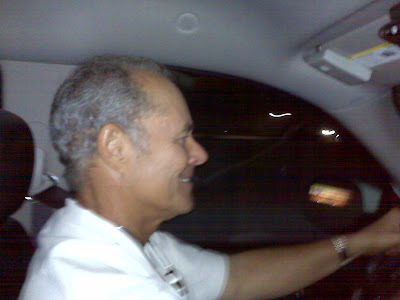 Photo of Ray on our drive home tonight taken with my cell phone. Thursdays are always long. On Thursdays we drive in to the San Fernando Valley to meet up with our sponsees and attend our Thursday night Just the Black Print meeting. Most Thursdays we usually drive in to LA around noon and return home 12 hours later. Ray had a dentist appointment with an oral surgeon in Encino at 2:30pm. Today we drove in at 10am. This earlier departure gave me just enough time to stop first at the REI in Rancho Cucamonga to shop for the Osprey EXOS backpack I’ve been wanting to buy. I tried the backpack on and liked it. I’m not sure there is enough cubic inch capacity for all I normally carry in my McHale backpack. But Ray bought the Osprey for me for as an anniversary present. Our 19th wedding anniversary is May 31st. If I find I can’t get all my gear inside, I’ll return it. But I’m excited because the difference I’ll save in weight between my normal backpack and this new one is 2 pounds. Each year I say I’m going to carry lighter and each year the fear of not having what I think I might need (like way too much food), drives my pack weight up. I’m anxious to try this pack out and see how it feels. On the way into LA I mentioned that I would like to make up the section of hiking I missed in 2007 from the I-10 to Big Bear (54 miles.) I went on a tour bus with this thinking and now I may join Be Hope and backpack this section to Big Bear with him. I left a message on Be Hope’s cell phone today saying I would like to join him for a few days if that is ok. Be Hope is the PCT backpacker I dropped off in Anza a couple of days ago saying I’d pick him up when he reached the I-10 freeway. I had no plans to hike with him, only to assist him with his food resupply. Anyway, Be Hope called and left a message from the trail tonight saying he was on Fuller Ridge in the San Jacinto Mountains. It appears he might be further along than we anticipated. Maybe he will arrive at the I-10 freeway under-pass Friday night. I’m supposed to meet him Saturday at noon. Now that I have it in my head that I want to join him on his hike I’m hoping he arrives on Friday so we have more time to hike the miles to Big Bear. I have to be off the trail Monday night. Ray said that he’d pick me up. I have to be off the trail on Monday so I’m ready to drive into the Baby Meeting in LA on Tuesday with others. Like I really need to add one more thing in my day. Aren’t tour bus rides fun? Two, no three, no four highs today. First high: I have been on the site Classmates.com for a number of years now, always hoping I will reconnect with some old friends. Yesterday I received an email saying James Duncan had visited and checked out my profile on the Classmates.com site. Could this possibly be the same Jimmy Duncan that was my heartthrob at University High?……The same Jimmy that had the cutest 1957 T- Bird? The same Jimmy whose car long ago would be parked in our family driveway at the end of our late night dates……. the car that made my Dad nervous……the car that made my Dad remain standing looking out his bedroom window, until he saw his daughter get out of the car, heard the house front door slam shut, until he knew his daughter was safely home in her bedroom. Alone. Great memories, first loves. I hope this is the same Jimmy. I am waiting back to hear. I responded with an email to James Duncan asking him what his first car was, before I open further communication. 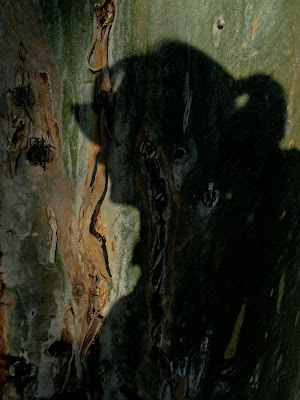 Second High: I found Laurie Excell’s photography website as a link on Scott Kelby’s blog. 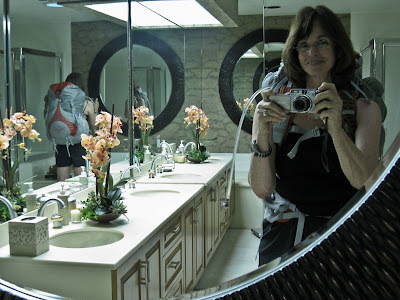 I want to do one of her photography workshops….the workshops where we photograph bears in Alaska or Chase Storm to photograph. I now subscribe to her blog posts and can’t believe her life and her photography. 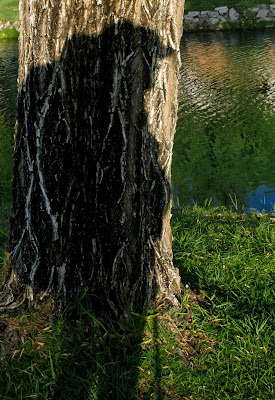 Third High: Again, I found out about this photographer, Eddie Tapp on Scott Kelby’s Wednesday Guest Blogger post. Every Wednesday Scott has a guest blogger. I am blown away by Scott’s guests’ essays and photos. Eddie’s blog was another uniquely informative essay. Fourth High: “My” teacher, Carol Leigh, you know the photographer I have been taking online classes and workshops with the last year and a half, is such an example for me. I follow her photography blog daily and can’t believe her commitment to practicing what she teaches, her artistry, the daily commitment to exploring her never ending, unlimited talents. She just keeps practicing seeing and produces the freshest, most uniquely-her-own, work. Life is good and thanks to all who contribute to motivating me to get more and more out of this good life. Into self and out of self…in one day! 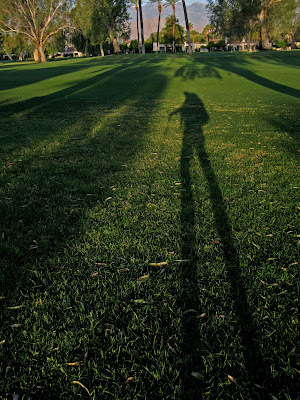 On my 6 am walk this morning, I found myself powerless over focusing on my shadow. At 11:30am I picked up Be Hope at the Palm Springs airport (a current year PCT hiker who was getting back on the trail.) After lunch, after organizing and mailing off a Big Bear resupply box, and buying trail food and having a deli sandwich made (big enough to last for 2 dinners! 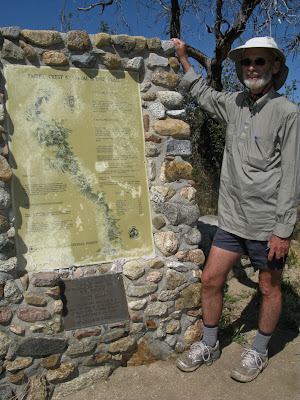 ), I drove Be Hope to the trailhead he had exited from when he had to go home and resume teaching his classes. Be Hope had started the PCT on March 11th. Personal matters will probably call him off the trail again, but hopefully not before reaching Kennedy Meadows. Be Hope was filled with excitement. His excitement is contagious. I’d only met Be Hope a couple of months ago hiking into Warner Springs. I’d given him my card in case he needed help while on the trail nearby the Palm Springs area. Well, he called when he was ready and knew the date he wanted to get back on the trail. 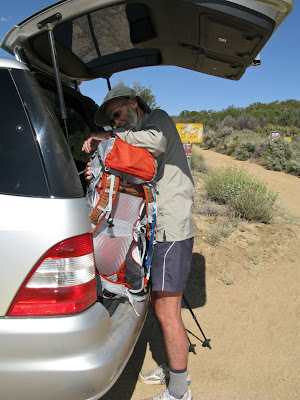 I offered to drive him back to the trailhead near the town of Anza. 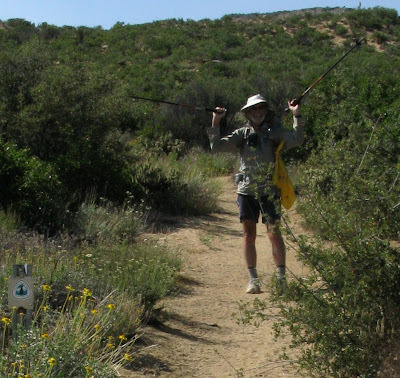 He cached water on Hwy 74 and bought and left extra water for hikers where he got back on the trail at the Hiker’s Oasis in Anza. He was going to carry food from Anza to Big Bear. I suggested he let me pick him up at the I-10 frwy to spend the night, shower, clean his clothes and pick up the remaining food for Big Bear he left here once he knew he had me for his own personal trail angel. Ray met Be Hope and was very impressed with what a nice man he was. I agree. Happy Hiking Be Hope. You sure do know how to enjoy yourself. I’m thinking of trying this pack out. Tailwinds used it and loved it. It’s the Osprey Exos or something like that. I told Ray I wanted it and he said he’d buy it for me for our 19th wedding anniversary May 31st (Cupcake’s birthday!). 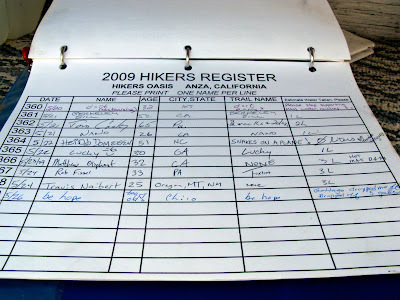 There were 369 hiker’s names listed so far for 2009. Hiker’s Oasis still has about 5 – 7 2.5 gallon containers of water plus 4 or 5 more gallons Be Hope left. The smile on Be Hope’s face made me smile. This man is happy to be back on the trail. Be Hope is a trail name. It just dawned on me his trail name came from his real name…..Barney Hope. Hiking the golf course with my pack. I have too many hobbies/interests. I need a lot more hours in the day to maintain balance and moderation in all areas of my life. –Food/eating has to head the list of interests. If I’m not eating good, I’m not a happy camper. I have been excellent in the area of eating to live, as opposed to living to eat. I’ve been planning, shopping and making good clean food for Ray and me for 175 days now. No sugar, no white flour, writing down and emailing the 3 daily meals and two snacks to Xochitl every day for the 175 consecutive days and I feel good. I’m afraid if I don’t send in my food, I’ll go back to my old ways of eating. I’ve been feeling in balance emotionally as the result of changing my food choices and my relationship with food. –Exercise. Hmmm. I could always do more. I’ve been carrying my backpack a couple of times a week hiking about 2 hours. I walk around Mission Hills CC a couple of times a week. Certainly not enough exercise to get me ready for the July 17th backpack I’ll be doing. Oh, I’m also doing sit-ups nightly with the hope my stomach muscles will help strengthen my back. –Photography. Not good here at all. I seem to have put practicing taking photos on hold. But I paid attention yesterday when I blogged that I hadn’t picked up a camera lately, so this morning I clicked off the shots below and other shots this morning while climbing up and down the hills on the golf course. The golf club workers, getting the traps and greens ready for the 8am shotgun, were laughing at me climbing up to the tops of a hills, turning around, descending them, only to hike up the same hills again. The goal is to hit all hills on the fairways. -I subscribe and am monthly automatically deducted for the cost of online access to photo lessons and don’t even do the lessons. 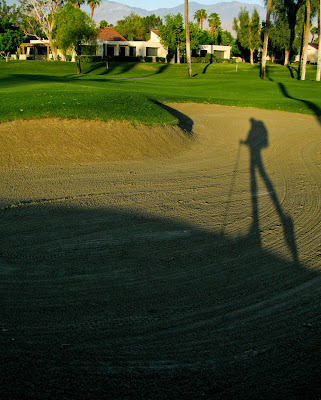 –Golf. I’ve been going out with Ray a couple of times a week around 5pm where he helps me with my golf as we play about 5 – 7 holes. The weather has been really beautiful at that time. We’ve been lucky to have temperatures under 100 degrees lately. I’m trying to get my old stiff back ready for our 4 day trip to Pebble Beach where we will use the two rounds of golf given to Ray by his sponsees a year and a half ago. Thank God I made and paid for the expensive golf room for two nights before the market crashed. 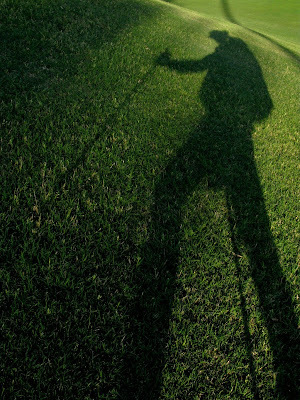 I do have a thing with taking photos of my shadow. Pretty place we live in isn’t it? A wonderful guest blog by Vincent Versace on Scott Kelby’s blog. How well this photographer communicates what I am learning in life and hope to someday learn in my photography (If I ever make time for my photography!). And yet another poem by Susan. I asked Susan to write daily. She asked, “What would you like me to write on?”. I responded, “I can’t, we can.” The following day I received her poem in an email. A gift arrived today from my wonderful friend, Tailwinds. Yesterday I received a note from Tailwinds letting me know she was sending me a surprise. She wrote that she knows art is a very personal taste and that buying art for someone else is risky. She went on to say that she had no doubt that what she bought me was meant for me. In the relatively short time Tailwinds and I have been friends we have shared extensively with each other in general conversations and during the 8 one to two hour long phone sessions sharing with each other the intimate self searching work and fantasies we wrote about in the task’s section of the Artist’s Way. During the 8 weeks of sharing personal thoughts and memories, She and I both probably mentioned at least 5 times that we would really like to live in a mountain cabin, by water. 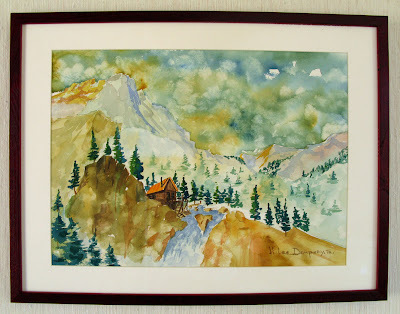 Tailwinds is friends with the artist H. Lee Dempsey, Jr. While at his home not long ago, pursuing his dream in retirement, she saw him working on his latest ink and watercolor painting below. Tailwinds said that she knew immediately “That’s for Gottago”. I love this water color. I have never had anyone buy me art before. Everything about this work is me. Thank you my very special friend.